Do you have toner cartridges for a Sharp photocopier model number AL 1452? I can only find the AL-1457 toner cartridges but nothing for the AL-1452? Unfortunately, we no longer list the Sharp AL-1452 printer model on our website. However, we can confirm that the Sharp AL-110DC toner cartridge and Sharp AL-110DR drum cartridge listed on this page for the Sharp AL-1457 printer are also the correct supplies for use in your Sharp AL-1452 printer. For small offices and homes, the Sharp AL-1457 is an efficient all-in-one device. 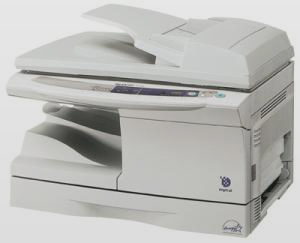 It has a monochrome laser printer and a digital copier; the scanner has a maximum resolution of 600 x 1200 dpi. Much to its credit, the Sharp AL1457 has a high paper handling capacity and a maximum of 2000 pages for the monthly duty cycle. However, the Sharp AL-1457 lacks a fax machine and does not offer support for Macintosh computers. The Sharp AL-1457 laser printer is quite large and bulky and weighs more than 20kg. It has a scanner on top and a paper cassette at the bottom. The control panel is easy to use and has function buttons. Copy speeds can go as fast as 14 ppm and the copier can copy a maximum of 99 pages. The Sharp AL1457 printer can handle 250 sheets but can be expanded up to 300. Users may choose from a parallel and USB port located at the back of the printer. With just one machine, the Sharp AL-1457 monochrome printer can already do 3 functions. It delivers crisp black and white text documents and gives good scans and copies too. The Sharp AL 1457 is robust and reliable and has high paper handling capacity. The AL-1457 multifunction printer does not offer faxing capability as well as networking options. The Sharp AL-1457 can only run on Windows computers; it would have been better if it had a duplexer.